Bumblehog, Camohog, Discohog, Draghog, Firehog, Minionhog, Rusthog, Zebrog. 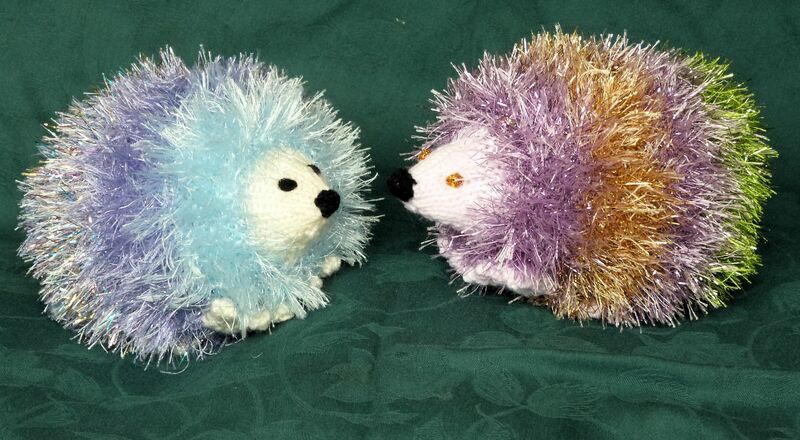 Welcome to Sheila's world of Hedgehogs! pre-school at Stoke Fleming in Devon. "Please Nana, can I have a knitted toy, knitted by you." As her birthday was in a fairly short time, that delightful answer, polite and direct to the point, got me thinking as to what sort of an appealing toy could be made quickly and simply. 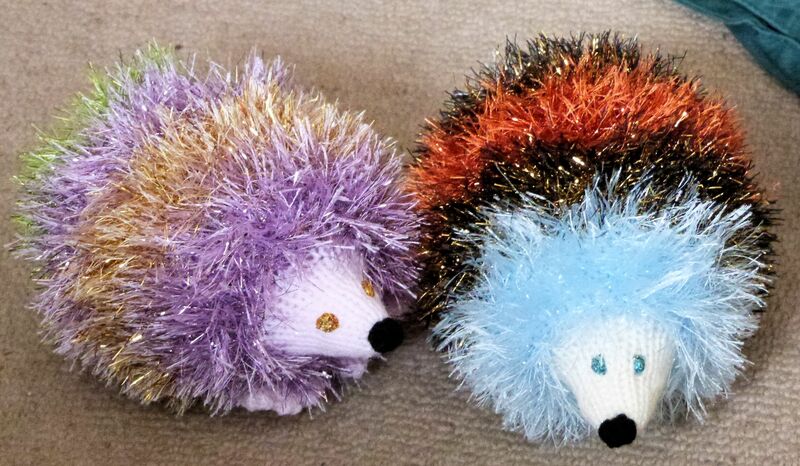 A search for suitable patterns ensued, and the answer became obvious - hedgehogs! 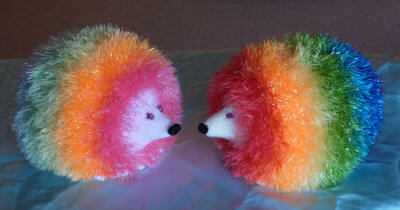 After a trial run, with some dozen hedgehogs ready for inspection, Isla and her younger sister Molly quickly established which colours they liked best, and at her sister's birthday party several boys also chose a different range of colours, most of which have been proven for popularity after a second trial run. So, with both Isla's and Molly's help, production has started as a fund-raiser for their primary school at Stoke Fleming in Devon, as from the start of 2017! Production so far (December 2017) has reached over 145 hedgehogs, several having travelled worldwide!! 28 were sold at the school's December Christmas Fair, and 24 others were recently sold at the Nuffield Hospital, Oxford. The latest donation to the school was £140. provided colours can be matched. using the email address above and below. 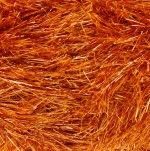 We consider, however, that these toys are NOT suitable for children under three years of age, because the tinsel wool used can shed. Please choose size, colour, & face and eye colours, and send these details either by letter or email to the address shown at the bottom of this page. Please also include your postal address, including post code, and contact telephone number in case there is a query. combinations of colours to your choice, either random or repeated. 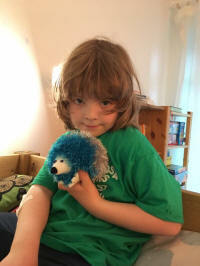 Requests for hedgehogs are dealt with in the order that thay are received, and will be dealt with as soon as possible. Each hedgehog is knitted by hand, and will therefore take a few days to be created. Packages will be delivered by Royal Mail, and sent Second Class. The cost will be added to the above prices, the amount depending on size of order. The postage is calculated by reference to both the weight and the volumetric size of order, and, together with the packaging, currently works out on average at about £4.60 per parcel within the UK. 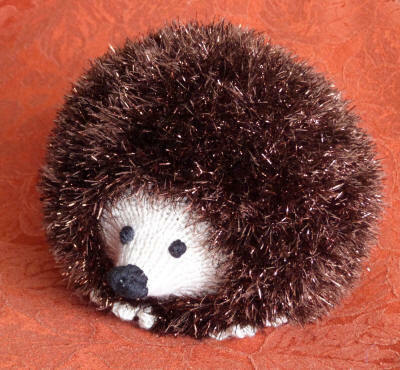 This cost is constant for up to 4 hedgehogs; orders larger than that would have to be packaged separately, each at the same cost. Second Class post can take between two and seven days for delivery. It is not our practice to trace individual parcels, although this can be done at extra cost. Other postal services, including tracking, are available through the Royal Mail, especially if urgent deliveries are required. Please contact Nana at either email or snailmail addresses below if such special deliveries are required. Please also contact her if Overseas deliveries are required. Deliveries by post will include an invoice for payment, and it would be appreciated if payment could be made within a week of receipt, together with any further donations to school funds, if so desired. Payments can be made by PayPal. Please contact Nana on her Email address hedgehogs@shelwin.com and she will send you an invoice with instructions as to how payments can be made.